Neotech, a division of OP/TECH USA, is a family-owned and operated company which has been manufacturing accessories for the music industry since 1986. We manufacture over 99% of our products in our Belgrade, Montana factory in the USA. The distribution of our products reaches far beyond our borders to over 30 countries around the world thanks to the tireless efforts of our wonderful distributors. We continue to grow thanks also to the loyalty and support of musicians around the world who believe in our products. This drives us to continue innovating and manufacturing at the highest possible level. We use only the highest quality materials available to produce a wide variety of straps, pouches and other accessories for the music enthusiast. We incorporate several types of materials in our strap designs to give them a truly unique feel and function. This allows us to maximize the combined benefits of the materials in order to increase the comfort level for the musician. Many of our straps incorporate neoprene, foam padding, elastic and Lycra binding to give a controlled-stretch effect which absorbs the shock of your movement while evenly distributing the weight over a larger area. This results in the instrument feeling up to 50% lighter and 100% more comfortable. Our other designs incorporate leather, webbing or textiles with a layer of memory foam to give added cushion and comfort while still having the more traditional guitar strap appearance. As all musicians are not alike, we offer several connection and strap options for both woodwind and guitar/bass players. For the woodwind player, we offer four connection options (Loop version and 3 hook styles: Plastic Open, Plastic-Coated Metal Open and Plastic Swivel). The straps in our woodwind line include several neck straps, slings and harnesses to fit all kinds of instruments and playing styles. We offer this same diversity in the connection options we offer in our line of guitar straps. We have custom hooks for classic/acoustic guitars as well as four options for guitar and bass (Standard Leather, Speed-Lock™, Slimlock™ and Cam-Lock™). By offering a large range of strap styles and connection options, we’re sure to have one that’s right for everyone. In addition to straps, we offer several accessories ranging from pouches for saxophone necks/mouthpieces to Sax Tone Filters and neoprene pouches for wireless transmitters. For the brass player we have straps, harnesses, neoprene pouches for mouthpieces and mutes along with neoprene valve wraps and unique one-of-a-kind grips for trombones. We also have our convenient Work Mats which are ideal for cleaning and repairing your instruments. Accordion players can enjoy a nice selection of different harnesses which each have their own unique features. We strive to have an accessory for everyone! Although our product selection has expanded greatly over the years, our commitment to superior function and quality still remains. Our products carry a lifetime warranty against defects in materials or workmanship because we feel that people still want a company and product that they can depend on. We know once you try our products and become part of our extended family, you will Feel the Difference! 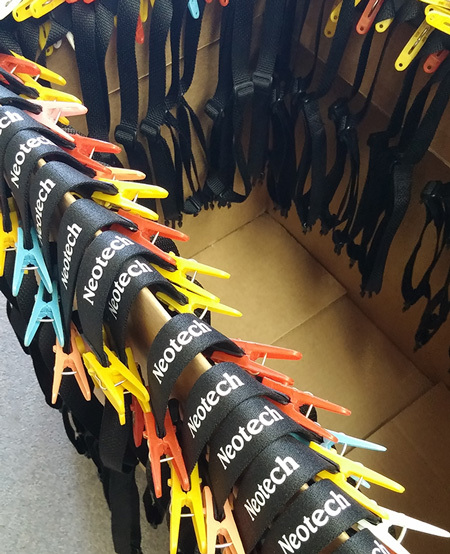 Get an inside look at Neotech in this short factory tour!